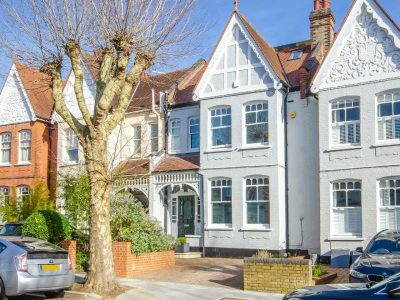 A characterful 6 bedroom Victorian family home with beautiful proportions and a pretty landscaped southerly garden on the prestigious Highgate side of Muswell Hill. This desirable and well loved family home is located on one of Muswell Hill’s understandably prestigious roads, backing on to Queens Wood and adjacent to Highgate Wood.. Arranged over three floors, the sitting room and dining room are gracious in size and feel grand. The bedrooms are currently arranged to include a self contained space at the top of the house. Both front and rear gardens are charming and inviting. Of particular note, there is a garage to the side of the house with a driveway in front. Onslow Gardens is one of Muswell Hill’s favourite roads and it’s very easy to understand why – elegant houses and great for all local amenities. Highgate underground station (Northern Line) is close by, as is the vibrant mix of independent shops, cafes, restaurants and cinema on Muswell Hill Broadway. Highgate Wood and Queens Wood are within easy reach and this location enjoys lovely views all around.